The Jio Oppo Monsoon offer has been announced that offers users up to 3.2TB of free 4G data and benefits worth up to Rs. 4,900. 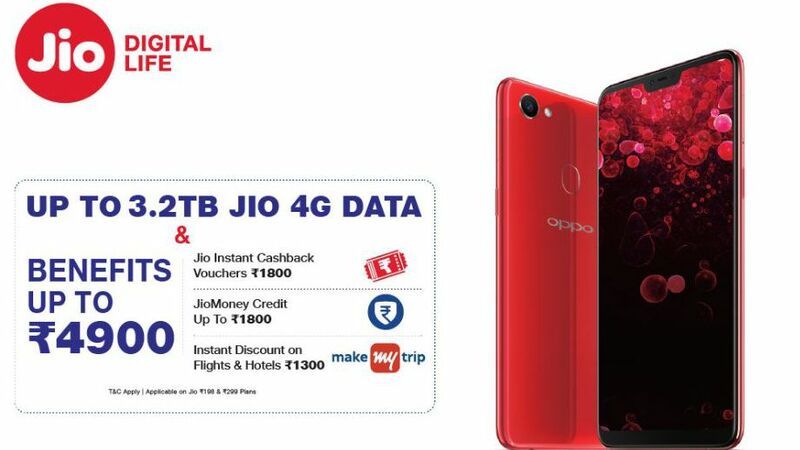 Reliance Jio has announced this offer in collaboration with Oppo and customers can avail of these benefits on buying a new Oppo 4G smartphone in India. The Jio Oppo Monsoon offer is applicable to both old and new Reliance Jio prepaid users. The offer is available only with the Jio’s Rs. 198 and Rs. 299 prepaid plans are eligible for the offer. The Rs. 198 Jio plan offers 2GB 4G data per day while the Rs. 299 plan gives users 3GB of data per day, for a validity of 28 days each. The offer starts from June 28 to September 25, 2018. As for the benefits, Jio subscribers, on buying Oppo phone will get 36 cashback coupons worth Rs. 50 each taking the total cashback to Rs. 1,800. The vouchers can be availed against monthly recharges for any Jio plan. The coupons are valid until September 30, 2021. Apart from that, up to Rs. 1,800 will be offered as Jio Money credit in three installments, after the 13th, 26th, and 39th recharge. The Rs. 299 plan can get you up to Rs. 1,800 Jio Money credit, while the Rs. 198 plan can only avail you up to Rs. 600. Lastly, MakeMyTrip is also the part of the offer and there are vouchers worth Rs. 1,300 valid until October 31, 2018. This makes the total benefit to Rs. 4,900. The coupons- one for domestic hotels and the other for domestic flights, will be credited within 48 hours of the first recharge. In order to avail the offer, log in to MyJio app and tap on ‘Recharge’ and select the Jio plan and tap on ‘Buy’. The cashback voucher will be automatically applied and then complete the transaction to redeem the voucher. Check out the full terms and conditions of the offer here. As mentioned above, the Jio Oppo Monsoon offer is applicable to all Oppo 4G phones, except the Realme 1.